Frustrated with dirty-looking tile and grout that won’t come clean, no matter how much you scrub? Our deep cleaning and sanitizing process uses a controlled, high-pressure wash to get even the dingiest-looking floors to look brand new again and leaves behind no mess or residue. 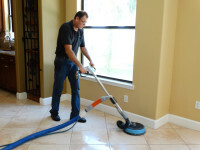 At Residential Express, we start by applying the appropriate cleaning solution for your floors. We allow the solution to remain on the surface, giving it the time it needs to completely disinfect the area. Then we agitate to break down the soil, grit, and grime on your tiles and deep within the porous surface of your grout. Finally, we clean and rinse the grout lines and tile, without the mess of a bucket and mop, using a high-pressure spinning tool. We also offer sealing services so that in the future, you’ll have time to wipe up spills before they become stains and so your routine cleaning and maintenance will be much easier. We can seal your grout to protect your floor against further problems. Our high-quality impregnator sealer protects grout lines against spills, dirt, oil, and other contaminants. For a dramatically different, uniform look, read about our grout color sealing services. If you are in the Central Florida area and are in need of professional tile and grout cleaning and sealing services, contact us online or call 407-947-1416 for a free estimate. We’d love the opportunity to serve you.